Live images on NASA television showed the spaceship approaching the orbiting outpost, then being grabbed with the station's robotic arm at 9:52 am (1352 GMT). "Capture complete," said NASA astronaut Peggy Whitson, who operated the robotic arm from inside the station. The spaceship is carrying almost 6,000 pounds (2,700 kilograms) of science research, crew supplies and hardware. It was originally flown on SpaceX's fourth resupply mission in 2014. Its arrival makes it the first US spaceship to return to the space station since the American space shuttle program ended in 2011. The latest mission is SpaceX's 11th cargo resupply trip to the ISS under a $1.6 billion contract with NASA. "We also want to note the special significance of SpaceX 11, which if we followed the naming convention of the artist Prince, could be called 'The SpaceX formerly known as SpaceX 4,'" quipped NASA astronaut Jack Fischer as he spoke to mission control in Houston. "We have a new generation of vehicles now, led by commercial partners like SpaceX, as they build the infrastructure that will carry us into the future of exploration," he said. "Now we'd better get back to work. We have a lot of stuff to unload." SpaceX is working on a version of its Dragon capsule that will carry crew to the space station, perhaps as early as next year. 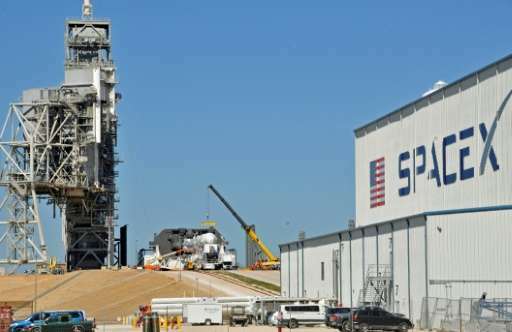 The California-based company headed by Elon Musk also regularly returns the first stage of its Falcon 9 rockets to upright landings on Earth, as part of an effort to increase reusability and lower the cost of spaceflight.